I'm often asked the question, "What's the difference between an automatic CPAP machine and a regular CPAP machine? ", so in this article I'll set out to explain the primary differences. First I'll say that I've always wondered why many people in the industry tend to call an automatic CPAP machine something other than what it is - an automatic CPAP machine. You'll often hear people call these types of machines APAP machines or Auto-PAP machines. I believe this is a result of a misunderstanding of the acronym CPAP. CPAP stands for Continuous Positive Airway Pressure, indicating that air pressure will be delivered continuously throughout the sleeping cycle. The term CPAP, however, doesn't imply that the continuously delivered air will be at a constant pressure. Therefore, the proper term to use for a CPAP machine which automatically adjusts the pressure setting according to your needs is automatic CPAP machine. A CPAP machine is designed to blow air through your partially obstructed airway in order to eliminate the obstruction and to allow you to breathe normally. What many people call "regular" CPAP machines do this by blowing air at a constant pressure throughout the night, regardless of whether you're experiencing an apnea - or cessation of breathing - or not. An automatic CPAP machine does not use a constant pressure. Rather, the machine is designed to sense your breathing through the use of a pressure feedback device. When the machine senses you are breathing well, the delivered pressure will be lower. On the other hand, when the machine senses you're not breathing well - that is, when it senses an apnea, hypopnea or snoring - the delivered pressure will be higher. Since most people with sleep apnea breathe normally for at least some portion of the night, it stands to reason that a constant pressure is generally unnecessary for effective CPAP therapy. Automatic CPAP machines deliver approximately 40% less pressure throughout the course of a night compared with a CPAP machine which delivers a constant pressure. This reduced pressure helps to increase patient comfort and compliance and makes CPAP therapy more tolerable for new CPAP users. If your prescribed pressure setting is relatively low - under 10 cm H2O - the primary benefit of an automatic CPAP machine may not be the reduced average pressure, but it may simply be that you don't have to worry about adjusting your pressure setting in the future. An automatic CPAP machine virtually guarantees you'll be getting optimal CPAP therapy regardless of changes in your condition. 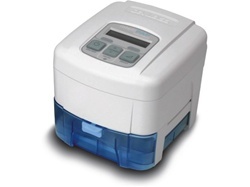 As with most CPAP machines, automatic CPAP machines are designed to deliver air pressure between 4 cm H2O and 20 cm H2O. During the intial setup of the machine the minimum and maximum pressures will be set. Usually the default setting of 4 cm H2O as the minimum pressure and 20 cm H2O as the maximum pressure is used. However, if your prescribed pressure setting is well above 10 cm H2O then increasing the minimum pressure might make sense. I would almost always recommend using the default minimum and maximum pressure settings since these settings will allow for the maximum average pressure reduction and the highest level of patient comfort. Another great advantage of automatic CPAP machines is that they're really two machines in one. You get a CPAP machine which adjusts pressure automatically, and you also get a machine which can be set to deliver a constant pressure just like a regular CPAP machine. This flexibility in functionality is attractive to many CPAP users, especially to those who are using CPAP equipment for the first time. There are two types of sleep apnea - central and obstructive. Central sleep apnea occurs as a result of a dysfunction in the thalamus area of the brain, while obstructive sleep apnea occurs as a result of an obstructed airway. CPAP machines are designed to open the airway for patients who suffer from obstructive sleep apnea, but CPAP machines will have no effect on central sleep apnea. Some automatic CPAP machines such as the Puritan Bennett 420E can detect apneas which occur with and without cardiac osciallations to avoid increasing the pressure during central apnea events in which the airway is already open. Similarly, advanced automatic CPAP machines can also differentiate between central and obstructive hypopnea (which is defined as shallow breathing).